Governor Mike Dunleavy has proclaimed February as Teen Dating Violence Awareness and Prevention Month. The month was established in law as part of a bill to develop a statewide curriculum known as Bree Moore Teen Dating Violence Awareness and Prevention Program. Former Governor Bill Walker signed the bill last year in the Anchorage Native Primary Care Center lobby, where he was joined by SCF President/CEO Katherine Gottlieb, employees, and customer-owners. Many remember Breanna Moore, known to her family as Bree, as a loving, energy filled 20-year old who lived her life to the fullest. Tragically, Bree’s life was cut short. She was killed by her abusive boyfriend on June 26, 2014. Her death left her family and loved ones heartbroken —devastated that they didn’t recognize the signs of abuse. 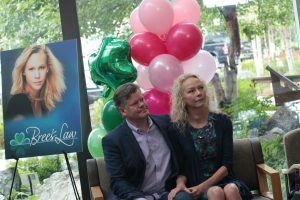 After Bree’s death, her parents, Butch and Cindy Moore, advocated for their daughter and worked with the Alaska Legislature to pass the Alaska Safe Children’s Act, now known as Bree’s Law. Dating violence is a pattern of behavior involving the use of threat of physical, sexual, verbal, emotional, or other abusive behavior by one person who harms, threatens, harasses, or controls another person within a current or former relationship. According to the Alaska Department of Health and Social Services, 4.5 percent of Alaska Native adolescents reported experiencing physical dating violence. If you or anyone you know has experienced teen dating violence, contact a behavioral health clinician through your primary care provider. If you are experiencing an emergency, please call 911.